April 21 2013, Gueuzerie Tilquin, Bierghes. It’s Toer de Geuze day @ Gueuzerie Tilquin. Today Master-Brewer Pierre Tilquin is introducing his 2013 Tilquin Quetsche à l’Ancienne. The Old Quetsche Tilquin is made from the fermentation of a minimum of 250gr of plums by liter of lambic. Unfiltered and unpasteurized and refermented in the bottle. First batch (2012) with a BB date of 23/02/2022 is made with ’Prune de Namur’ and limited to 500 bottles. Second batch (2013) limited to 5000 * 75cl and 10000 * 37,5cl. The Tilquin Quetsche à l’Ancienne is now available @ Belgiuminabox.com both in 0.375 L & 0.75 L bottles. Just 1 day before Toer de Geuze 2013, Brewery 3 Fonteinen has released the 3 Fonteinen Intense Red Oude Kriek. The 5% Oude Kriek is brewed with a whopping 40 kg of cherries/litre of young lambic !! Yet another masterpiece of geuze-brewer Armand Debelder with the help of young brewer/blender Michael Blancquaert and what a way to kickstart the new 3 Fonteinen brewery !! Also notice the new 3 Fonteinen brewery logo on the label of the bottle. 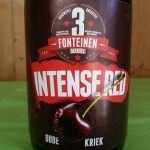 The 3 Fonteinen Intense Red comes in 0.375 L bottles and is currently available on Belgiuminabox.com.